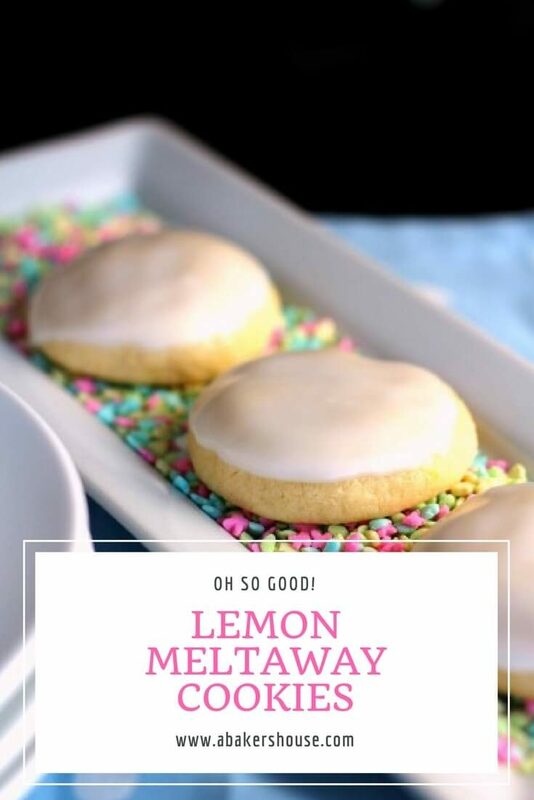 A bright bite of lemon sings in these lemon meltaway cookies. Perfect for wedding showers, baby showers, Easter, and spring celebrations. The seasons are changing and winter is fading to the new growth and life of spring. It is also a time for celebration in many cultures with holidays such as Easter or Passover. Today the #CreativeCookieExchange is sharing spring cookies and we’d love to know how your baking helps you celebrate special days and holidays. 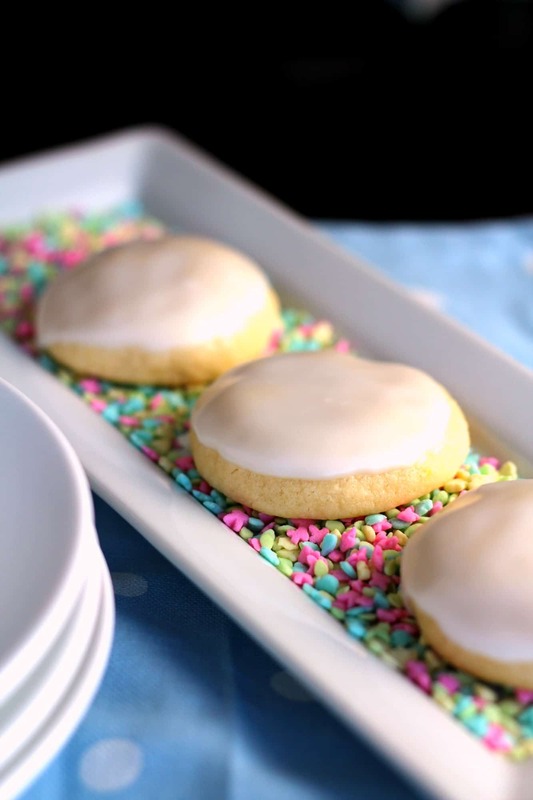 I’m sharing these lemon meltaway cookies with Easter in mind. The brightness of lemon seems to wake me from winter’s heavier eating routine– simply squeezing lemon in warm water to start the day would be a healthier alternative to fix my lemon cravings…but if you need a lemon cookie to lighten your spirits, this is the one! Lemon zest, juice and even lemon extract (if you have it) come together to make these delicate cookies. You won’t be able to stop at just one! I started with a recipe from The Novice Chef. She made almond meltaway cookies and almond will be on my list next, not to mention orange, chocolate and Nutella meltaways. I really liked these cookies and think they could be customized for nearly any holiday OR just any day of the week. I think you’ll agree. Original recipe for Almond Meltaways from The Novice Chef. Preheat oven to 375 degrees F. Prepare a baking sheet with parchment. In one bowl gently whisk the flour, baking and salt. Set aside. In a stand mixer beat the butter and sugar until light and fluffy. Add the egg, lemon zest and lemon extract. On slow speed add the flour mixture. Do not overmix. Take about 1 tablespoon of dough at a time and roll into small balls. Place on lined baking sheet and press gently to flatten the tops of the balls of dough. Bake for 8 minutes then remove from oven. You can take a quick look at the bottom of one cookie to see that it is lightly browned, but the tops of the cookies should still be pale. Slightly underbaked is better than slightly overbaked with this cookie for sure. Cool on a wire rack. For the icing: wait until the cookies are completely cool. Whisk the lemon juice and powdered sugar until smooth. Dip the top of each cookie into the icing then let set for a brief time until the icing is firm. Oh yes! I totally agree these would be great for any day of the week (and holidays too!). Looks like we both had lemon on our minds! I agree these would be great anytime, but in spring, I love the sunny look of a lemon! Gorgeous cookies. 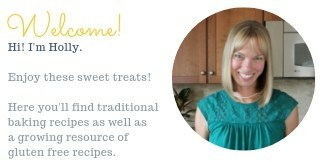 Got to try these cookies… they look so light and the description sounds refreshingly delicious! Those look adorable nestled in the sprinkles filled dish! Lemon is so light and bright, perfect to welcome spring. Anything with the name meltaway in its title, sure appeals to me. These look like the perfect spring cookie! I am not a lemon lover, but call me when you get to nutella! So pretty, Holly! 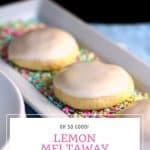 I just love lemon cookies in general and lemon meltaway sounds perfect for spring! Two great minds .. I had to make use of lemon, lemon zest and extract in my cookies too along with other citrus. It really is a nice burst of flavor to celebrate spring. These look so pillowy soft and flavorful and, with my weakness for lemon, they are definitely on my list to make. 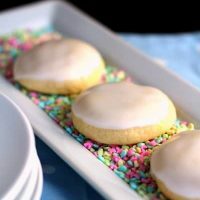 These look delicious, and lemon cookies are perfect for spring! I love the tart and fresh flavor of lemons. These cookies are perfect for any day when winter wants to creep back like it did last week. These definitely look like they would melt in my mouth after one bite. Very enticing photo too as I’d love to reach through the screen for one, or two right now.